"I dreamed of you, even before I knew you were real. In all my years of wishing, I wished for you. The moment I saw you, I felt it. My whole world shifted. My whole existence grew brighter." This series is fantastically unique, and with this installment it's utterly and completely done. Is it possible? No more Lela. No more Malachi. I will miss them, but I have to say this was a very satisfying and completely perfect ending to this series. 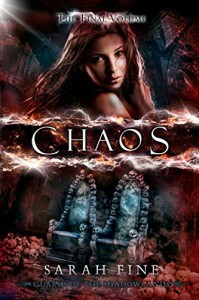 Also, if your one of those people who were disappointed by the setting of the second book, then you should find the setting for Chaos more favorable. I highly recommend this series if you are a young adult or a 'young at heart' adult who enjoys a unique blend of Paranormal, Fantasy and Romance.